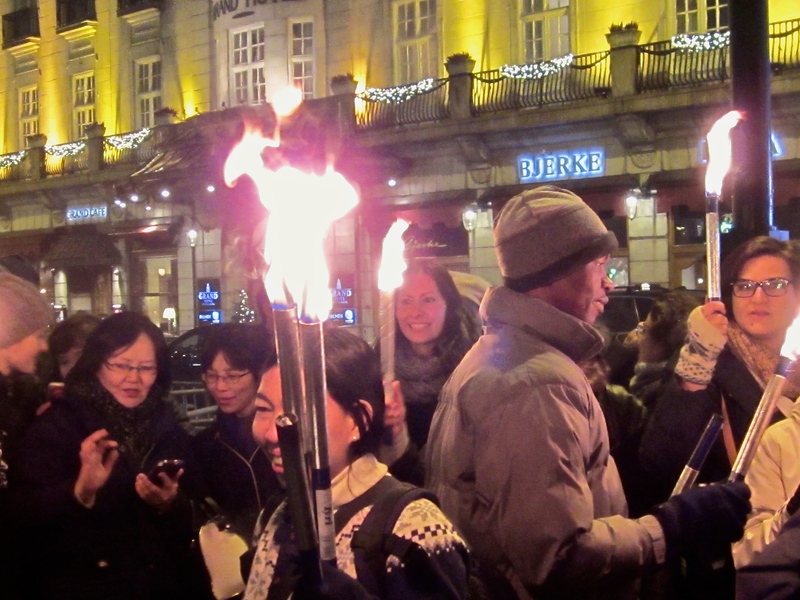 Despite the rather intimidating torches, goodwill pervades the crowd. Kailash is on the left, Malala is on the right, and Malala’s mom is in the center. This year, Matthew and I didn’t get out from work in time to march, or to film the event, but we were fortunate enough to arrive for the balcony appearance. There wasn’t a dry eye in the square when Malala Yousafzai and Kailash Satyarthi walked out and began waving. You’ll remember Malala as the young Pakistani girl who was shot in the head by the Taliban for speaking out about educational rights for women and children. Kailash leads the fight to end child slavery and exploitative child labor in India and worldwide. Gotta be honest, I feel incredibly lucky to have been part of the crowd, cheering for and waving to these two amazing people. 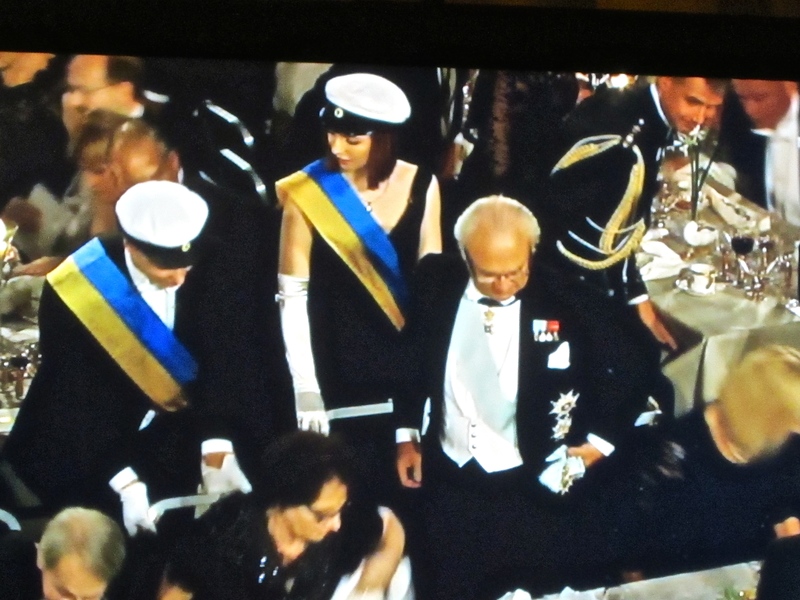 Afterwards, we went home and watched the coverage on NRK (the Norwegian national TV station). Beginning days beforehand, NRK broadcasts interviews and news footage of all the Nobel Prize-winners, and I have to say it’s absolutely fascinating. If only inspiring stories and admirable people like this got such serious air time in the U.S., as opposed to train wrecks like Honey Boo Boo and The Housewives of Orange County. Guests being escorted by skipper-hatted young men and women. 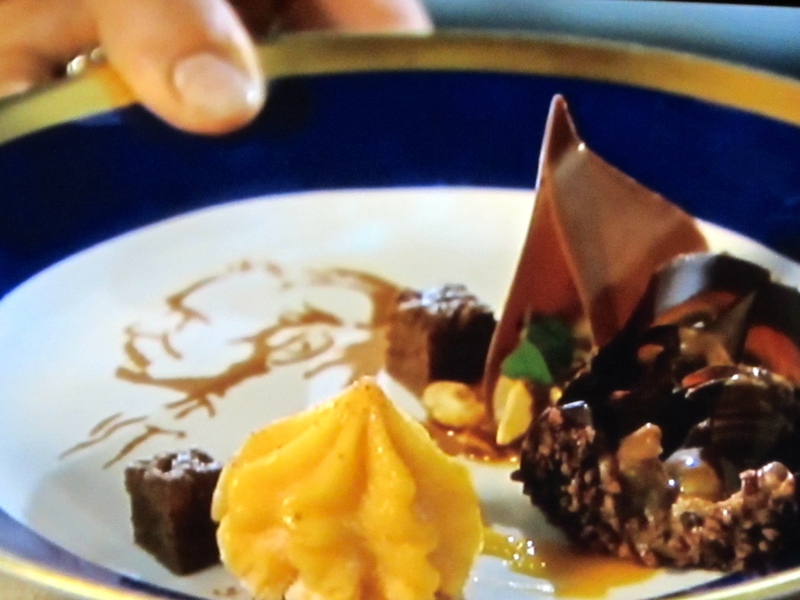 The 2013 dessert plate — note the profile of Alfred Nobel dusted in real gold on the plate. Then in come the white-coated waiters, two-by-two, carrying each course on a silver tray lit by a giant sparkler. At halftime, the dinner guests are treated to a dance or operatic performance, then the recipients give brief and typically quite moving addresses, after which waltzing rounds out the evening. Throughout it all, local correspondents wearing couture gowns narrate the event, offer comments on the royal family’s jewels and fashion, and interview guests as well as the chef, who makes a helluva five-course meal each year. 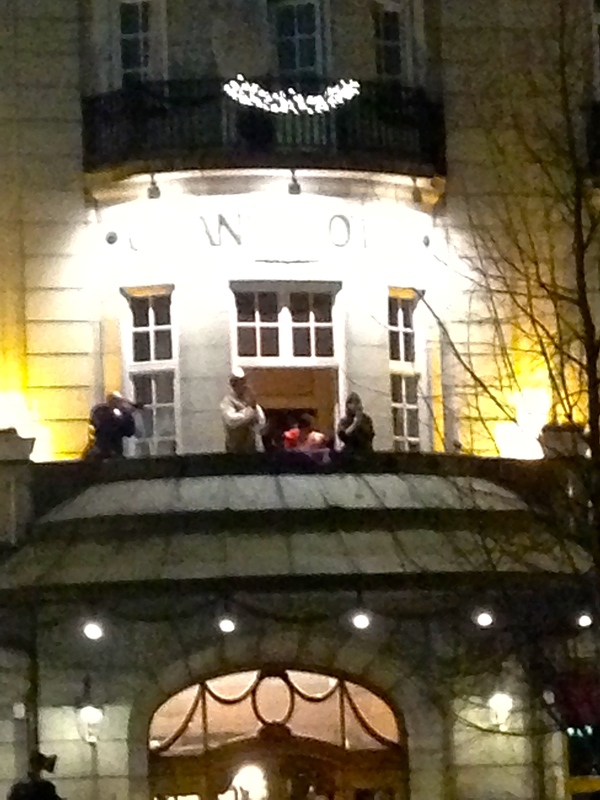 The Grand Hotel balcony ceremony in 2013. Matthew and I have sat glued to the TV for hours as the whole week surrounding the prizes plays out. We always come away wondering what the heck we’re doing with our lives, when people like this are making such huge contributions to the world. It’s definitely a wakeup call for those who are watching. And it’s also pretty amazing to think that the whole Nobel Award concept was dreamed up and funded by the guy who invented dynamite and was nicknamed the “merchant of death.” I guess guilt really can be a good motivator for a truly altruistic idea. Loved your Nobel prize entry! 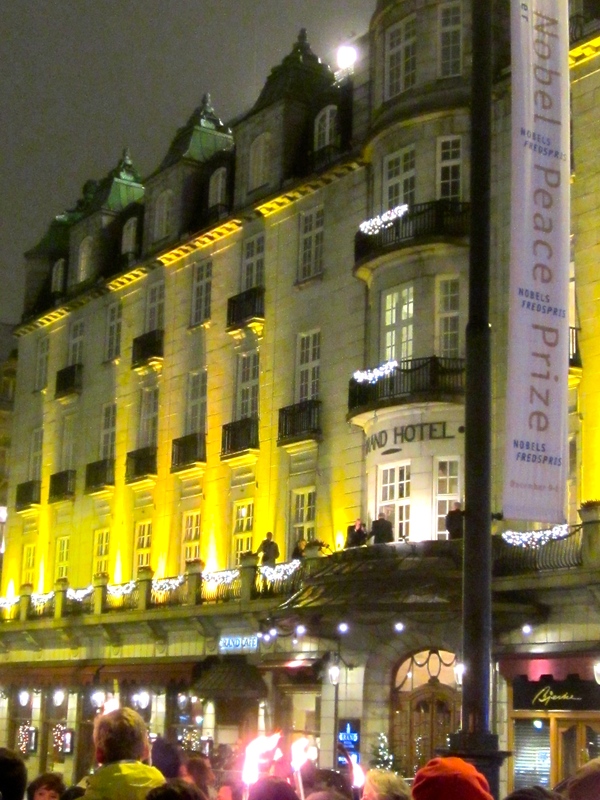 I didnt know the Peace one was given in Oslo. Also I remember from my Novenber days in Finland, that it cAn get really “dark” so melatonin supplements and watch A Death in Paradise on Netflix if you have it,…. trashy British mystery but magical setting! !